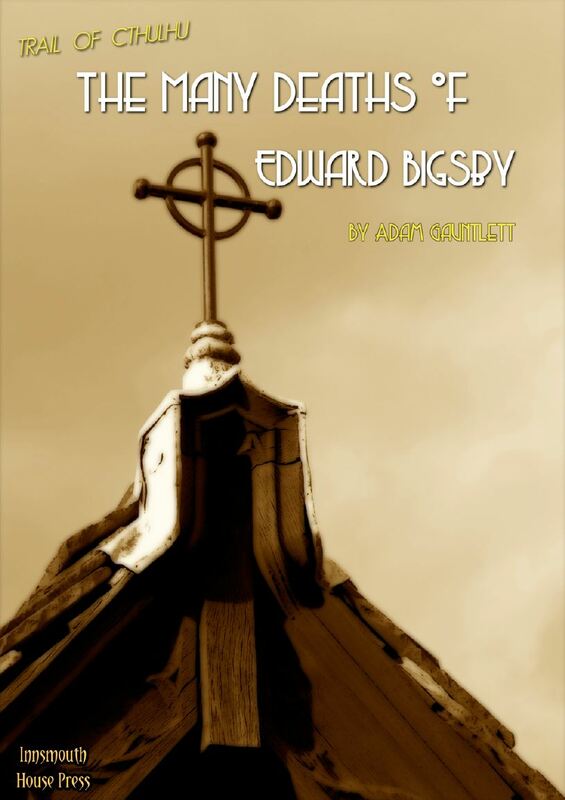 The Many Deaths of Edward Bigsby is a 34-page adventure for Trail of Cthulhu, written by Adam Gauntlett. The adventure follows a two-column format with clearly marked chapters and sections, denoting key and alternate scenes. Bold lettering picks out key concepts, checks and spends. The body of the supplement includes a scattering of contemporary images garnered from the public domain. Images tend to fill space at the end of sections, cropped as if cut-out and placed on the page (with a shadow along the side). Non-player character statistics appear in each relevant chapter, with some repetition where key personalities reappear. I’m impressed by the proofreading and editing, as I found the adventure an easy read and only stumbled across a single spelling mistake. Set in 1930s London, the characters receive a visitor – Edward Bigsby – who appears relieved to have found them, only to die a few moments later in quite a spectacular and disturbing fashion. Luckily for the them, the few words he uttered and the items in his possession provide enough clues for them to pursue some personal investigation as to why he’s carrying a business card with one of the investigators names on it, who killed him, how and why. Trail of Cthulhu provides an interesting snapshot of the 1930s, serving up studious or pulpy approaches to Lovecraftian game play, depending on your preference. Many Deaths feels a little more on the pulpy side, but a capable Keeper might take the source material of the tale and rework it more toward a scholarly approach. The Many Deaths of Edward Bigsby draws very heavily on real world events, locations and people, providing a section on Soho, along with the nefarious people and violent events that made it a dangerous, but exciting, place to visit. The whistle stop tour of Soho’s underbelly adds various elements around the involvement of Russians, Chinese, Irish, Italians and others, each who exploited the area to their own ends. A wily Keeper could easily spin out any number of subplots, hooks or red herring from this material. The characters get a chance for library use, museum visits, breaking-and-entering, run ins with the Police, and a spot of barter with certain questionable businessmen, while pursuing their key line of investigation. While a single happy path to a conclusion runs down the middle, many alternate scenes and peripheral encounters mean that this could run for a few sessions before reaching a conclusion – or might be pared right back to one or two. 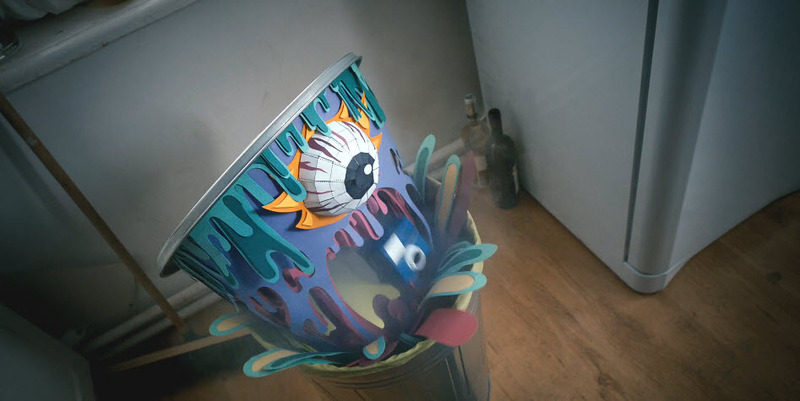 I don’t want to spoil the story, but like a Moffat plot for some of the truly memorable new Doctor Who, the adventure might very well leave the players suspicious of an entirely everyday object when they see it in future – whether in game or real life. A cruel GM would play on this to crank up future fear and suspense, even in completely unassociated games, involved players from the same group. Adam points out on more than one occasion amidst the background details of personalities that he has shifted their activities and timelines somewhat to fit with the 30s backdrop. I felt that this point, while not immensely laboured, could have been cleared up with a single brief word at the start. I understand that Trail favours the 1930s and a few characters, in real life, ran rackets in the 20s – I don’t have a problem with that, so it didn’t warrant all the mentions. A quick note that people, places and events have been based on fact, but adjusted to fit the game’s timeline would have sufficed. While specifically written for Trail – and with repeated note to that effect, as already mentioned – the adventure includes a final chapter on running Many Deaths with Bookhounds of London. Originally devised as a campaign framework for Trail, Kenneth Hite span it off as a separate, and substantial, setting book. Bookhounds frames the characters as enthusiastic collectors and vendors of esoteric books in 1930s London, peddlers in mouldering volumes and crumbling first editions. I stumbled across the setting after reading Iain Sinclair’s ‘White Chappell, Scarlet Tracings‘, which deals somewhat uniquely with antisocial and malcontent bibliophiles, digging through the noisome heart of London and beyond searching for that one elusive must-have volume. I digress somewhat… but, anyway, the final chapter provides an option to adapt the adventure for Bookhounds. It includes an additional alternate scene that allows the characters to interact with a key NPC. Personally, I like the Bookhounds option, as the plotline has much involvement of several key – and rare – books or editions. On top of that, anyone with a strong grounding in London history, architecture and the occult will perhaps find much additional colour in leylines, mystic geometries, and places of power… but, I’m wandering off back to Sinclair again now. Aside from the cover art and an image of a door knocker, Many Deaths features images sourced from the British Library Public Domain Flickr collection. While an admirable use of a freely available image source, I found the images largely irrelevant and unconnected to the text – indeed, as fine a picture as it may be, the church spire on the front cover left me wondering whether someone had used the wrong image altogether. The Many Deaths of Edward Bigsby is a stand out investigation in 30s London, with excellent potential for expansion and possibly even a sequel. Depending on how the player investigators handle the affair, they could easily find themselves on the sharp end of the law and one or more key underworld gangs in Soho. The worst case scenario might even find them unable to enter the capital ever again for fear of their lives, or hung for multiples murders. As with other Trail adventures, Many Deaths sets out key clues, alternate lines of investigation, and populates a potentially meandering path toward a frantic denouement. In 34-pages, it provides enough information to extend the scope and depth considerably and, drawing on real world people, locations and events, means a little research could go a long way. While written for one version of Cthulhu gaming, I see no barrier to adaptation to your favourite pulpy or occult horror system of choice. A great Trail of Cthulhu adventure, filled with wonderful potential for confusion and insanity. Speakin’ as the gent who wrote it, many thanks for the kind words about Bigsby. I should clear up one issue: this wasn’t written under the GUMSHOE SRD. To the best of my knowledge you can’t do Trail that way, as Trail is under a form of license from Chaosium – the Cthulhu connection – so Simon kindly agreed to let me publish this via YSDC, so long as all the profits went to YSDC. That way I had Pelgrane’s permission to use its Cthulhu material, all benefits going to a website that Simon and I both appreciate. I may write under the SRD at some stage, but not for Trail. That’s why, incidentally, I relied so heavily on the British Library Flikr. It’s not a perfect source, but there’s a lot of stuff there. Though I was surprised at the lack of London-specific material; there seems to be more in there about Tasmania than there is about the Smoke. It’s a pity. I know for a fact there are several defunct tabloid photo archives with period-specific stuff, but they’ve all been claimed by one conglomerate or another, and they charge fees for use. With no profit for me in this, I couldn’t afford to start paying for pictures, and we weren’t able to persuade an artist to donate his or her effort gratis. I hope those of you out there who use this scenario enjoy it! Firstly, thanks for reading the review Adam; very good of you to take the time to leave this comment as well. I have adjusted the review to remove the reference to the SRD. My bad. Seeing the Open Licence and the reference to the SRD in the back of the adventure, I obviously got the wrong end of the stick. Easily done – and easily sorted. As regards the pictures, I appreciate the budgetary constraints. I think the strength of the adventure transcends the need for the images, in all honesty. Given the weak connection to the adventure’s events in many instances, the pictures add very little – and I wouldn’t have felt aggrieved if they weren’t there at all. Personal feedback, that I hope actually comes across positively – the adventure is excellent and would stand alone as image-free text. Wish you all the best, and thanks again for reading.